I think leap years are king of neat. My childhood friend Adam, who I haven’t spoken to – or thought about much – in more than 10 years, gets to celebrate his 7th birthday. Happy birthday Adam, wherever you are! I feel like a get a bonus day of being in my 20s. (Detail people, I said “feel“). I do, in fact, get a bonus day to my work on my 30-before-30 project. Which is awesome. I think it’s kind of weird – and also kind of awesome – that science doesn’t work perfectly. 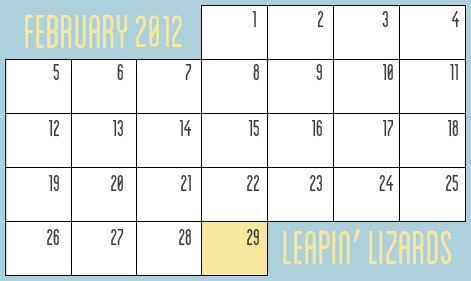 The best way I’ve heard a leap year described is as a “compensation for a cosmological inconvenience“. I love that. If we didn’t have leap years, the seasons would just drift through the calendar over time. And, although certain units of time (seconds, minutes, hours) are arbitrary, days are based on the rotation of the earth on its axis, and years are based on the rotation of the earth around the sun. So it should work. But it doesn’t. Which is neat. Leap years also kind of throw me off. I’ve been operating under the premise that I’m doing a iphoneography 365 challenge. Turns out it’s actually a 366 challenge. I just realized this today. Crap. Now to go change the name of my tumblr blog. Also I’m used to March days being the same as February days. It makes all of March special, instead of one day in February special. This year, I need to get used to March days being one off. But wait! There’s more! You didn’t think random ramblings about leap years were all you were getting today, did you? On Sunday night, I learned about leap seconds, which are needed for two reasons: one because the solar day is very slowly increasing and two, because the atomic second is very slightly shorter than the regular second. I did not previously know about these seconds, but was excited to learn that there is going to be one added to the end of June this year. So I get a bonus day AND a bonus second to complete my 30-before-30 project. So, go out an enjoy your “extra” day, peeps! Live it up!